Clock Spring | PLC Services a.s. 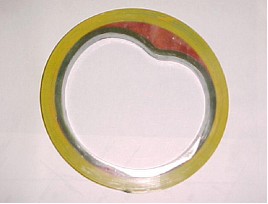 Clock Spring assembly is composed of a composite fiberglass sleeve of high strength, produced in a coil shape with eight threads with a diameter corresponding to the size of the pipe. Additionaly kit contains patented two-component adhesive that is applied between layers of composite and two component pressure filler to compensate an uneven surface of the pipe. 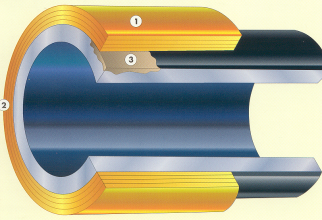 The filler with high compressive strength between the surface layer and the initial pipe sleeves ensures transfer of the load from the pipe to the sleeve. All materials used are health safe and environment friendly. Application to pipe diameter DN 100 to DN 1400, for normal operating temperatures up to +120° C.
Approved permanent repair for external corrosion losses, mechanical damage (dents, scratches, scratches, grooves, etc. ), repair and disposal of circumferential welds technological defects or other defects on the pipeline with high and very high pressure. Fixed part of the pipe is stronger (pressure resistance) than the original undamaged pipe, repair corrosion loss of up to 80% loss of metal. The system provides full internal reinforcement corrosion defects, but like all types of externally applied corrections can not be considered a permanent repair, if not taken steps to prevent further growth or corrosion monitoring. Other derivative products Pipe Support, Leak Stop, Snap Wrap and Contour, which further extend the scope of the pipeline operation. Customized engineering software GRIwrap developed to characterize and evaluate the severity of defects assessed to determine the suitability of repairs or repairs without leaving excision or recommendation. In accordance with codes and modification B31G. installation without interrupting or reducing pipe operations!